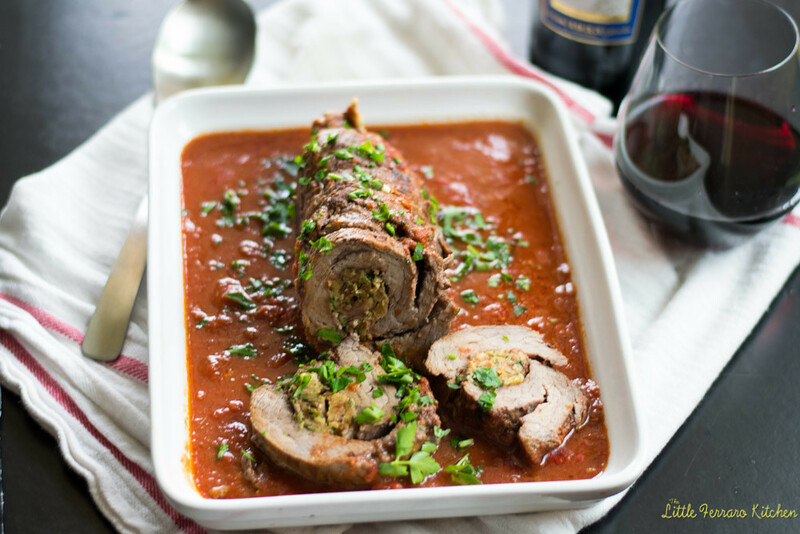 A traditional Italian dish, beef braciole recipe is a flank steak wrapped with prosciutto and Parmesan and slowly braised in a hearty marinara. Happy #SundaySupper! love participating in “theme” events and today is especially fun because we are paired up with Gallo Family Vineyards! You can imagine my happiness when I received 2 bottles of wine at my door. I love, love cooking with wine and really feel it gives dishes such abundant flavor. My favorite dish to use wine in is in a good hearty red pasta sauce, such as linguini puttanesca. Every time I make a marinara sauce, wine is always on the ingredient list. The flavor reduces and thickens with other aromatics and really offers amazing layered flavor. I was gifted with both Gallo Family Vineyards’s sweet white wine and Merlot, and being the red girl that I am, couldn’t wait to pop open the Merlot. 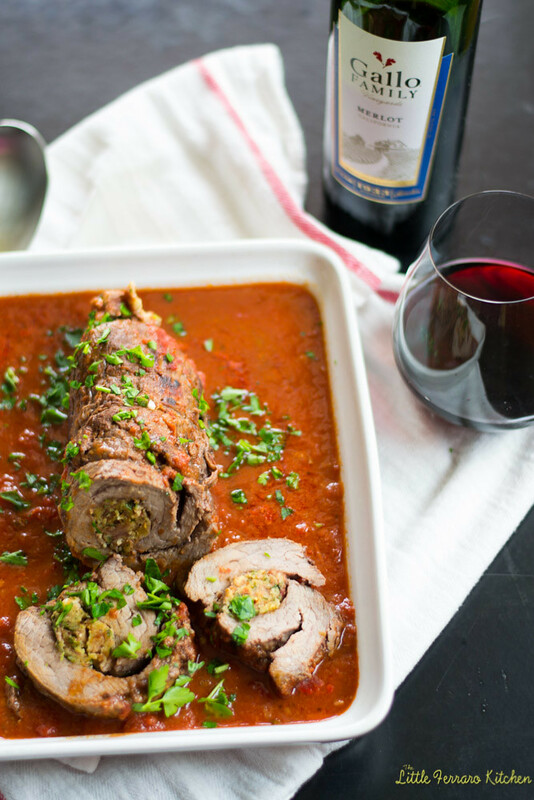 I was already dreaming about this beef braciole recipes for weeks and knew it would be the perfect match to a hearty Sunday dinner. Every Sunday, Joe and I make it important to stay home and cook a meal together, usually Italian because it’s our favorite. We sip wine and prep our ingredients. Sip more wine and attempt to cook while laughing at each other and old stories. This is why I love cooking dinners at home. Beef Braciole is an Italian recipe. So let’s talk about Braciole. This is an Italian dish where meat is rolled up with other flavors and stuffing ingredients, such as my braciole stuffed with prosciutto. I used a 2lb flank steak and pounded it out to even the thickness, but cutlets work just as well. I made a braciole filling of caramelized onions and garlic, prosciutto, breadcrumbs, Parmesan, egg and fresh herbs and rolled the filling into the steak. Then once the meat is seared, I used the delicious meat drippings to make a fabulous deep red sauce. It was pure heaven. The meat slowly braised in the sauce and was the perfect accompaniment to a good glass of wine. 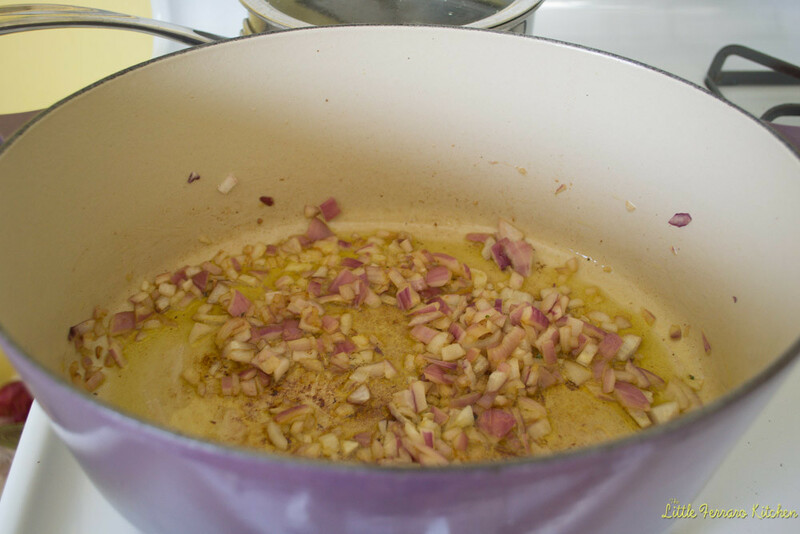 1) First caramelize onions and garlic in olive oil. When done, add to a bowl. 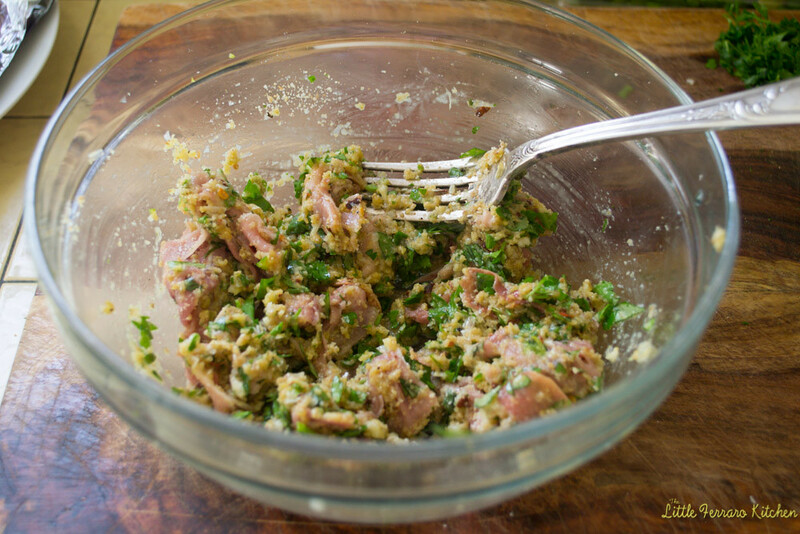 2) Make the filling by combining the onions and garlic, prosciutto, egg, breadcrumbs, fresh herbs and Parmesan. Mix together and set aside. 3) Remove flank steak from package and lay between 2 pieces of plastic wrap. Use a meat mallet (or anything hard) and pound the flank so the width is even. 4) Remove the plastic wrap and place the filling evenly on the steak. 5) The begin to roll the steak, making sure the filling is tight inside. 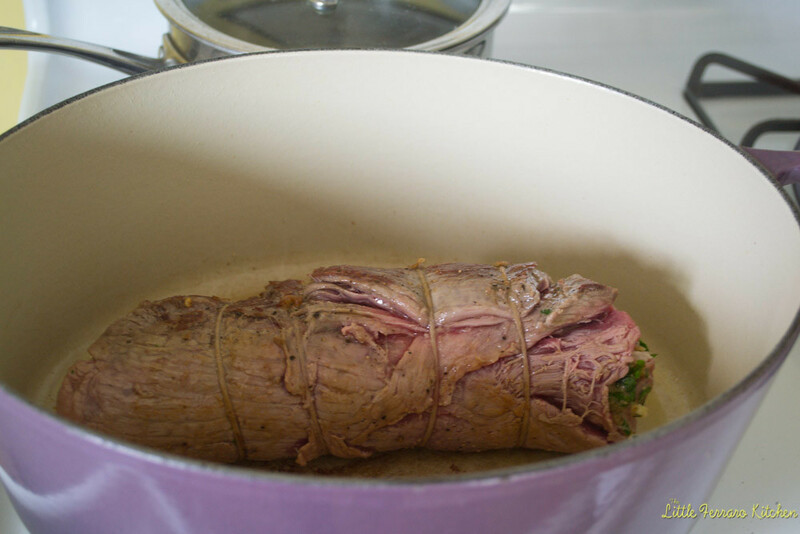 Once rolled, use butcher string to tie the steak in several places so that it is as even in shape as it can be. Season with salt and pepper. 6) In a large dutch oven or pot, drizzle with olive oil and sear the braciole on all sides. Once seared, remove to a plate. 7) To the same pot, add chopped onions, garlic, dried oregano, red pepper flakes and sauté until onions are translucent. Add tomato paste and stir to combine. Then add 1 cup of Gallo Merlot and deglaze while using a wooden spoon to scrape the bottom. The wine should reduce by half and thicken. 8) Add crushed tomatoes to the pot and season with salt and pepper. Add the braciole (with any juices that have accumulated) into the tomato sauce and cover the pot, leaving a small opening. Allow the sauce to come to a boil and then reduce to a slow simmer. Allow to cook for about 1 hour to 1 hour and 30 minutes. When done, the meat should slice easily and tender. 9) When done, slice meat and serve with additional sauce. Garnish with fresh parsley and basil. First caramelize onions and garlic in olive oil. When done, add to a bowl. Make the filling by combining the onions and garlic, prosciutto, egg, breadcrumbs, fresh herbs and Parmesan. Mix together and set aside. 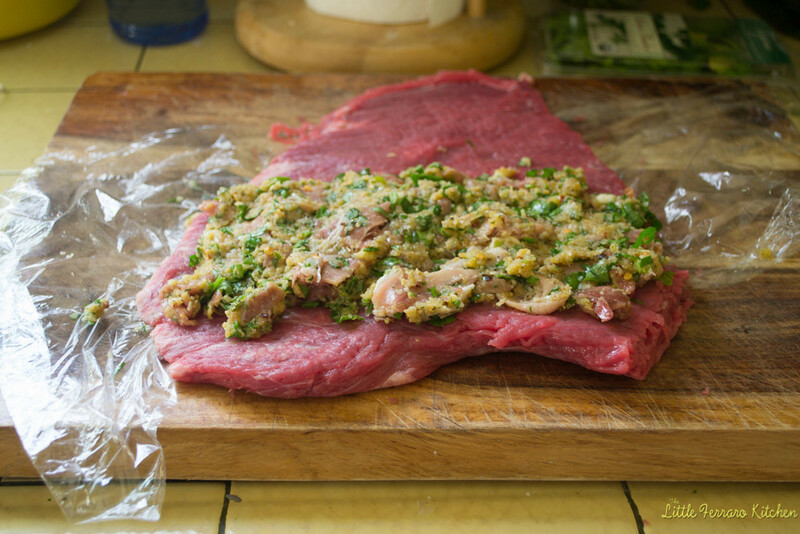 Remove flank steak from package and lay between 2 pieces of plastic wrap. Use a meat mallet (or anything hard) and pound the flank so the width is even. Season with salt and pepper. Remove the plastic wrap and place the filling evenly on the steak. Then begin to roll the steak, making sure the filling is tight inside. 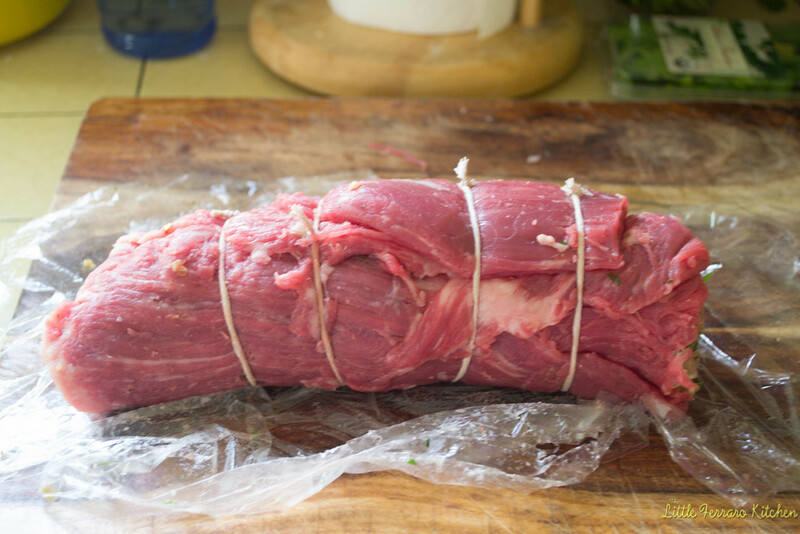 Once rolled, use butcher string to tie the steak in several places so that it is as even in shape as it can be. Season with salt and pepper. In a large dutch oven or pot, drizzle with olive oil and sear the braciole on all sides. Once seared, remove to a plate. To the same pot, add chopped onions, garlic, dried oregano, red pepper flakes and sauté until onions are translucent. Add tomato paste and stir to combine. Then add 1 cup of wine and deglaze while using a wooden spoon to scrape the bottom. The wine should reduce by half and thicken. Add crushed tomatoes to the pot and season with salt and pepper. Add the braciole (with any juices that have accumulated) into the tomato sauce and cover the pot, leaving a small opening. Bring up to a boil and then reduce to a simmer and cook everything until meat is tender and cooked through, about an hour and a half. 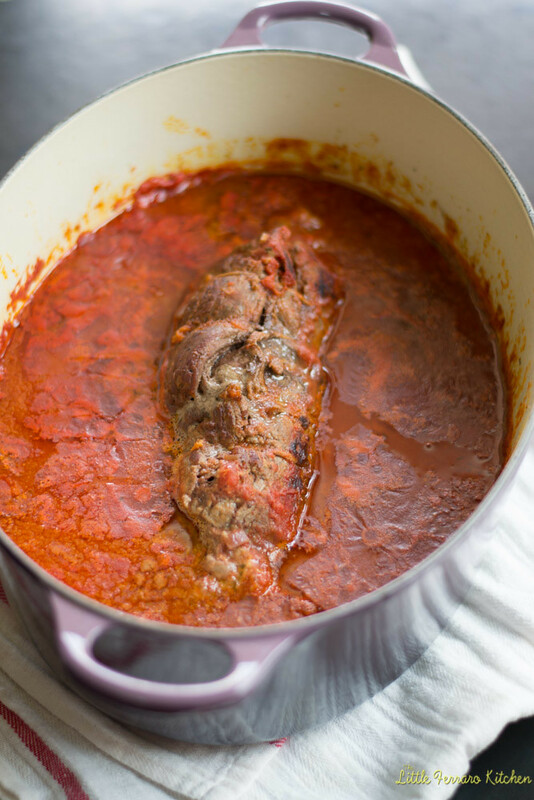 To serve, remove braciole from sauce and if allow to rest for 10 minutes. Then cut strings off braciole and slice into 1/2 inch thick slices. Serve with marinara sauce and garnish with fresh herbs. Please be sure to follow Gallo Family Vineyards on Facebook, Twitter, Instagram, and YouTube. And their website has information on all Gallo Family wines, a store locator, and pairing guides. And please check out what the other Sunday Supper’s made with their Gallo wines! Join the #SundaySupper conversation on Twitter each Sunday. We tweet throughout the day and share recipes from all over the world. Our weekly chat starts at 7:00 pm ET and you do not want to miss out on the fun. Follow the #SundaySupper hashtag and remember to include it in your tweets to join in the chat. And check out our #SundaySupper Pinterest board for more fabulous recipes and food photos. This will be one of my Sunday Suppers soon. Love it! Ohhh yes make it and let me know!! Thanks Renee! I’ve never made a braciole, but I’m glad to learn the ropes from a pro! Yours looks divine…picture perfect!!! I LOVE this dish!!! can’t wait to try it. . and Sunday dinners at home are the best!! love this! You have completely inspired me to try making braciole. Hard to believe I haven’t made it before. Yum! What a great Sunday Supper! I love the flavors you put together. The Merlot is a perfect pairing! Wow wow wow – this dish is seriously stunning! I am with you – I love cooking dinner at home. Breaking open a bottle of wine, talking, joking around, and just enjoying each others’ company is something I really enjoy! Wow, you took me right back to the ’70s when my mom used to make stuffed flank steak all the time. YUM! Thanks for the tutorial! Braised meat is so delicious. I also love staying home and cooking dinner with my husband over a bottle of wine. It’s a great way to connect, it’s cheaper then going out, and it’s always better. Your tutorial is a great idea for your readers! Braciole is so popular again and yours looks awesome! I have wanted to try making beef braciole for so long. Your recipe has me inspired to finally get me into that kitchen to cook it!! Mmmmmmm… Delicious! What a perfect Sunday Supper! 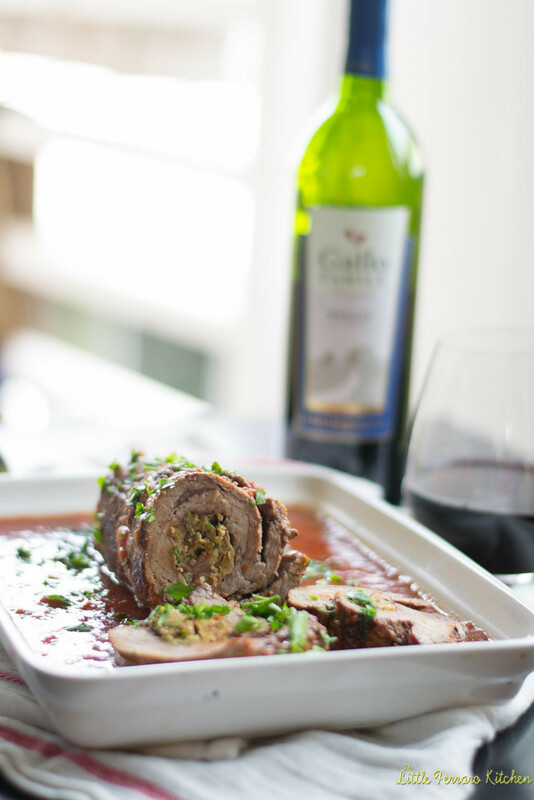 Braciole is something I have to tackle, and yours with the addition of prosciutto looks amazing! Your photography is STUNNING, Samantha. This is a dish that I wouldn’t *think* would photograph easily, but you made it look effortless. I’m so impressed! This is definitely a Sunday Supper, pinned and printed! Holy goodness…this looks amazing! Can’t wait to try it out…I still have my Merlot since I used the Sweet White Blend in my recipe! Oh I’m sorry, please excuse me while I wipe DROOL off my keyboard! WOW~! Oh my gosh this looks amazing! I knew it would be good after our Twitter discussions, I just didn’t know it would be THIS good. Prosciutto and caramelized onions?! This is a must try! Gorgeous dish! Gallo’s Merlot is my favorite, and would be absolutely delicious with this Sunday Supper. Thanks Alida! And LOVED your bread pudding! I made braciole once but haven’t tackled it again as of late. This recipe is going to change that. Pinned! Ohhh yes please make it again!! Thanks Melanie! Red wine is perfect for cooking this type of dish, it looks beautiful! I love making rolled beef dishes! This looks fantastic! I love cooking with wine, too. 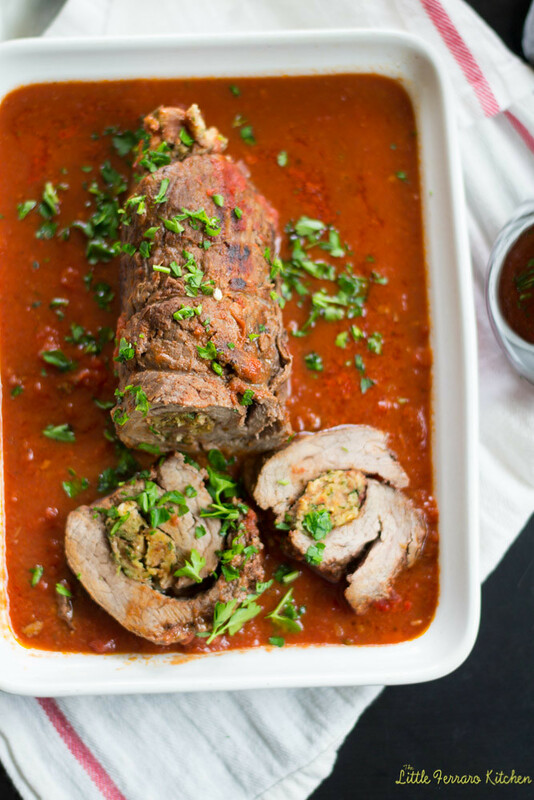 This braciole looks incredible! This looks delicious! I’d love to have this with a glass of red wine. 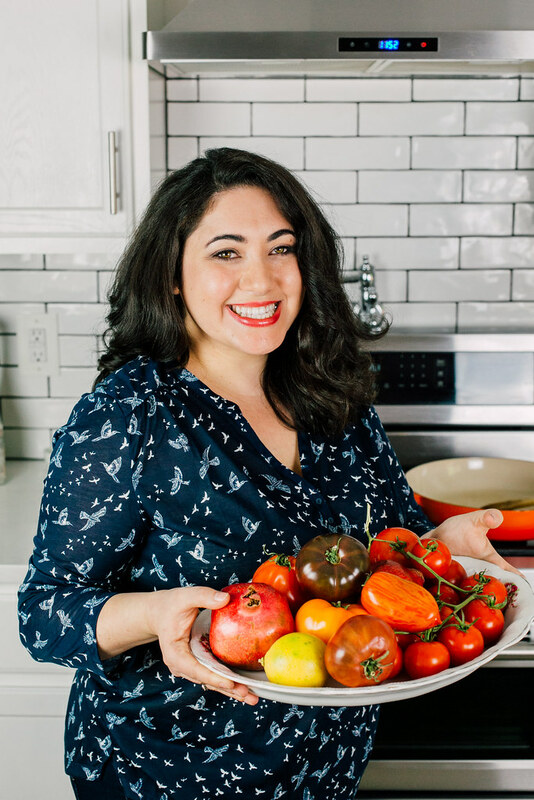 I never really knew what went into braciole…until now! Looks and sounds amazing and it is now definitely on my “to-make” list. Anything made with flank steak is guaranteed to be super good! Thanks Amy!!! Hope you make it soon and let me know! Ok first: stunning photos! Looooove. But second, I love your Sunday tradition. I want to do that when I get married (or before haha, no need to get married for this). Sunday afternoon drinking wine and meal prepping. That sounds wonderful! What heavenly comfort food! Perfect for a chilly Sunday dinner! This recipe is simply mouthwatering! I want to make this to completely impress my family! I have never had or heard of braciole, but I think these flavors would be great for my family! Adding it to my dinner rotation now! It’s a lovely dish, definitely weekend dinner worthy. And the slow braise in the tomato sauce is heavenly! Can’t wait to hear how it goes! My husband is going to LOVE this recipe! Cannot wait to try! This is such a gorgeous dinner! Perfect for date night in! I printed the recipe but I noticed that the list of ingredients doesn’t have tomato paste, crushed tomatoes or what type of wine (the instructions do say 1 cup). Can you please update? I’m dying to make this!